PC's Blog: And the UK cover, too! Hmm.. I like both covers a lot! But I think that I might like the American version better, because I'm a big Stark fan and I think Heath is cool too. :-D But I really like the UK version, and the font that the title is written in! LOVE the House of Night books!! YAY! I cant believe Tempted is coming out soon! I live in singapore and the books are actually released rather early!! I LOVE both covers by the way! But i like the UK one better! I love the HON series! Yes I can not wait for Tempted to come out I prefer the UK cover. I can not wait to see your tour dates. i love both of them but i like the american one better. i can just tell from the american cover that there will definetly be more drama between Stark and Heath. Can't wait til Tempted and all the other books come out. love the house of night series!!!!! Yup, my vote is for the UK cover over the American one. I wonder how many sit-ups the model had to do to get those abs. Has to be Photoshop. Yeah, that's it. Sigh. 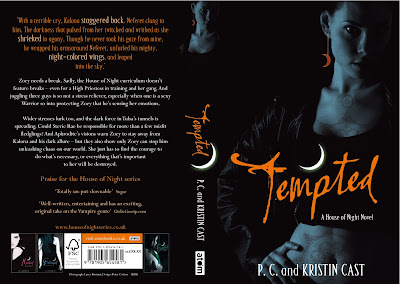 Hey PC, I really like the American Book cover for tempted and the British one. But, I think the American one has some edge cause the guys are on the front. All I have to say is, AWESOME JOB with the covers!! I can't wait to get my hands on one of the books when they come out!! I <3 House of Night! Oh, I am so in love with the US version. Stark is a hot on the cover. i like both covers a lot but i would hav to say the american one. oh n my friend asks why isnt erik on the american cover wit the rest of zoeys bfs? an wow stark looks hot in that cover (shy smile)!!! Guys, keep in mind I'm consistently on Team Zoey. She's too young and inexperienced to find her "one and only" at seventeen. I'm likin the UK cover, except that they make Zoey look way older than 17. I mean dang, I don't even wear shirts that show my stomach and I'm older than her! I prefer the UK Cover. I feel it has more continuity with the previous covers than the American version does. Re: Erik and "changing" people in general. Staying in a relationship with the idea that "he/she can change" is not wise. And no one, especially not Erik (or me, or Kristin, or Zoey...), is perfect. p.s. And being with someone because he's/she's "totally HOT" is silly! I myself am on "Team Stark" all the way !!!!!!!!!!!!!!!!!!!!!!!!!! PC your such a MOM lol, and i was relieved (sp?) to read that Tempted isn't the last book YAY!!! I just wanted to say I am team Heath all the way! There aren't to many fans of him, so I gotta stand up for the guy. I feel sorry for Eriks, but mostly I feel sorry for heath! thanks. GO "TEAM STARK" !!!!!! i like heath to cuz he wouldnt try n hurt zoey n hes sweet. but i feel sorry for him cuz he really loves her but like zoey said he doesnt fit into her new life. i know, heath and zoey were like ment to be. but erik might find someone else too. at least im hoping so, cuz i so want stark and zoey to be together, starks been through so much. i really like both covers but i find the american confusing cuz they used diff. models. and the uk cover looks a bit, idk, but i like them both, alot. the american provides mystery, and the uk suggests suspense. i love them both! I can assure all of you that we're not done with Erik, though I think you'll be surprised at what happens with him. So what about heath 0_o? Omfg, theirs all kinds of ideas thats running threw my head about Erik! :D Ahhhh PC, when does the first chapter come out? i love the american cover better but still like the other cover 2. I like this one so much better. The US one... It's nice, but... It kind of breaks the trend of only having Zoey on the cover. This one is much more suiting. Also, PC, why on earth did your publishers choose to have that gorgeous poster from Hunted on the inside of the book jacket instead of something separate?! I love the poster, but I can't put it up anywhere because I need the book jacket. It's completely unfair! Ahh! I am definitely Team Stark! And I really like Heath, he's so sweet, and I feel bad about him 'cause he doesn't have a real/fair chance with her cause he's human, and she's ya know.. a vampyre fledgling! I think Eric is okay too, I used to really like him but his possessiveness kind of turned me off! And PC! You shouldn't have told us that we'd find out in later books.. Now that'll be on my mind for a VERY long time..;-( hehe. From what I understand my publisher is releasing selected lines from TEMPTED in August and then in September they'll post chapter one. I cannot wait for this book, I have loved the others in the series since my friend literally MADE me read them!! Now I wouldnt live without these books, but I love the UK cover more than the American, as it matches the rest from the series. I like the American cover better. My friend and I were annoyed when we realized that the UK cover was different and were going to get that one instead of the American one which we both prefer. I dislike the UK one and wish the American cover was also the UK cover! I love the books and can't wait to read Tempted! Im gonna buy the US cover cause its cooler. cant wait for the first chapter! PC... please give me some kind of hint with whats going on with Erik!!!!!!!!!!! Nope, not giving spoilers/hints. You'll have to wait (impatiently). Hees. As I've said before, I don't know our tour schedule yet, but will post it when it's finalized. Sorry, if I'm hanging out in chat rooms I'm not writing. This blog is really the only place I post consistently. Much prefer the UK cover - lucky since I love there! I cant wait for the book to come out ive been waiting 4 it forever! and personally i like the UK covers better for all the books except maybe betrayed i havent decided which i like better for that. i like the uk cover better than the american one. Well I like background of the American cover more, but I think the writing on the UK cover is better. So I guess I like them both alot! I might be kinda late for the argument but im on TEAM ERIK! i don't care if he probably won't be "the one" for Zoey but oh boy he sounds deliciouss!!! I AM SOO READY FOR THIS BOOK!!! I CANT WAIT, both covers are awesome but of course I like the one with zoey, like A Lafont _ Lurver said zoey is hot!! YOUR BOOKS ARE AMAZING CONGRATULATIONS ON ALL THE SUCCESS. I have to say i like the american the best, mostly because i am a huge Stark fan. I also like that in this one there is more than just Zoey. it was starting to get boring have the some character over and over again. i am in no way saying the other covers are bad but it is just nice to have a change. I like both but in my opinion it looks more like Erik in the background instead of Heath from how hes described in the book. But i still like it.